If you have participated or watched any prestigious cross country or track and field meets in California, Tim O'Rourke's (photo above courtesy of Sarah Reingewirtz) voice will be a most familiar one to you. California state cross country meet? Yup, that's him. California state track and field meet? Yup, that's him as well. Foot Locker National meet? Yup, that's him again. Mt. SAC Invitationals? You are right again. If you just take Tim's announcing prowess alone, he would be worthy of being a California cross country and track and field legend but he was and still is much more than just an announcer. When Tim retired from teaching and was honored by the LA84 clinics, his friend and fellow coach Ken Reeves described Tim as a teacher, tech specialist, administrator, coach, meet director, camp coach, announcer, friend/mentor, worker, and TV personality (see below with photo courtesy of Foot Locker XC)! Related Article: CA Coaching Legends, Ken Reeves. Tim O'Rourke started coaching at his alma mater Arroyo HS in 1978. The year before Tim became the coach, Arroyo had forfeited every meet due to lack of athletes. In just three years, O'Rourke turned Arroyo into a league and state section power. From 1978 to 1998, Arroyo had a dual meet record of 139-7 (5 of those losses took place in his first year) including 14 straight years of undefeated dual meet teams as well as 15 varsity league titles. O'Rourke had a prominent role in the first California state cross country meet as you will see below. He was also named Gatorade National Cross Country Coach of the year in 1997 (photo below courtesy of Aron Taylor and XC Nation). As a track and field coach, O'Rourke's teams posted a sterling dual meet record of 146-9. He was named California Track and Field coach of the year in 1997. He was inducted in the Mt. SAC Relays Hall of Fame in 2000. In fact, O'Rourke has been inducted in 5 halls of fame! Tim has also been a tireless clinician all over the state and has worked at the LA84 Clinic for over 20 years and thousands of coaches. In 2015, O'Rourke (photo to left courtesy of Runner Workshop) received the Jim Brownfield Mentor Coach award and was introduced by coach Reeves. "This year's winner, Tim O'Rourke of Arroyo High School in El Monte, would have made Jim proud. He is a Hall of Fame coach who daily gives back to the sport and the coaches of the sport. 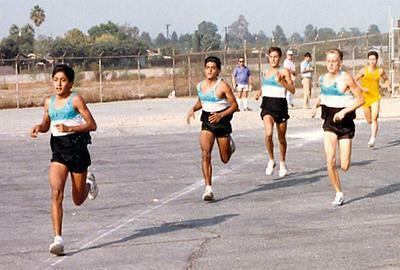 If you saw the movie McFarland USA, it is factual that McFarland won the state championship in 1987 in Division III. However, the first ever California State Championship team that year was Arroyo, coached by Tim O'Rourke. The Division 1 champs that year, their team time would have once again captured the D1 title this past year. Standing the test of time, the 1987 team ended up being ranked #1 in the Nation by Harrier Magazine and XC Nation. For his excellence as a cross-country coach, Tim was selected as the Gatorade National Coach of the Year in 1995 and the California State Track and Field Coach of the year in 1997. But Tim's legacy is not just about his excellence as a coach. He, like Jim Brownfield has motivated thousands of us to be better coaches. 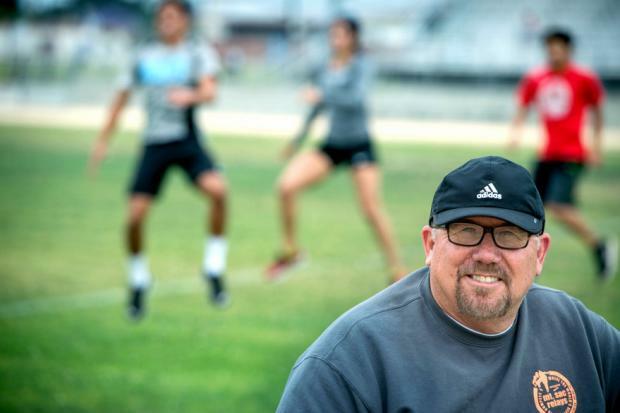 As the director of the LA84 Coaching Education program in both Cross-Country and Track and Field, his programs have impacted the sports, helping raise the level of the sport across the state. As a meet director, he is in charge of numerous meets, including the largest cross-country meet in the world, the Mt. Sac Invitational, where over 25,000 traverse the famed course in two days. As an announcer, there is none better. 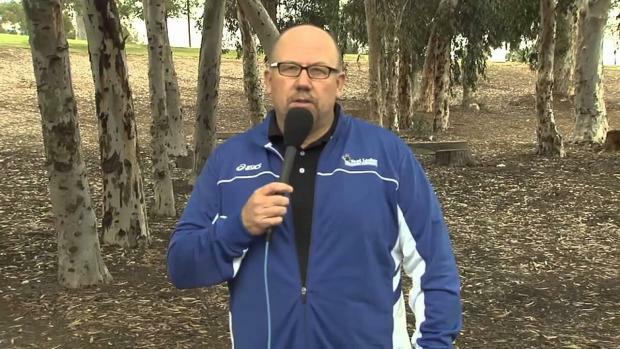 His great calls at the California State Cross-Country Meet and the California State Track and Field meet electrify and educate the crowds. A true icon in the state, Tim is known throughout the state as the ultimate educator, motivating all around him to step up. I am sure even tonight, with his brief time at the podium, he will find a way to mentor us. It is an hour to introduce the 2015 Jim Brownfield Award winner, Tim O'Rourke." The following story was also shared by Coach Reeves. "Santa Claus story: Had a history of getting "magic" socks for athletes before the postseason competition. Magic socks obviously have powers to help the feet run faster. In 2004, Bill Tokar had developed the fantastic Ventura High School team that broke the then Mt. Sac record and I think were ranked as high as #2 in the nation that year. I was along for the ride as an assistant coach. Always try to make the state meet an experience rather than just a championship race. We would dress for dinner, eat at DiCiccio's and try to make the weekend a special memory. Would also try to relax the athletes just a tad. The 2004 VHS group was a very serious group, with the Bryant twins, Jessica and Tara being the most serious of the group. Both have graduated from Harvard and are MDs now. I thought little things like the magic socks were not something that they would even consider. However, on the way up, Jessica mentioned that the team hadn't received magic socks yet. I mentioned that I had just forgot to get them and this team was too good to even need magic (a rather cocky statement from me because no team is too good not to need a little magic-magic is what makes teams special.) She accepted that and went back to discussing physics homework with her sister on the way up. That night, we went to a DiCiccio's on Blackstone. There were several other teams in the restaurant and we had reserved the back room. Dinner was almost over when Santa (Tim O'Rourke in the best Santa costume ever) walks through the restaurant with his sack of goodies. He is doing the ho, ho, ho and asking all the other teams in there if they knew where the Ventura Cougars were. Directed to the back, he dropped his sack, recited the poem on the picture with Santa (not the O'Rourke Santa) and then handed each and every girl an individually wrapped present. Inside of the present was the 2004 version of magic socks. After that he was just gone, but not before saying as he exited the restaurant, "A good race to all and to all a good night." Immediately after that, we went to the mall to get a team picture taken with Santa. There is another complete story about that but does not involve Tim. On meet day, the Cougars won the meet and got to go up on the podium. Introducing them was none other than Tim O'Rourke. Not a single girl realized that he was the Santa from the night before. Back then, he used to do a little interview with the team and mentioned that they had been visited by Santa the night before. Brought a huge smile to all of the girls' faces, but it wasn't until later that we let them know that Tim had been Santa." If you want to check out Tim in action, check out the video below for the 2011 Boys' Foot Locker National Championship race.